Did you know you could make money online tutoring without leaving the comfort of your home? Online tutoring is a continuously growing industry with many opportunities for everyone, ranging from college students, tutoring newbies, or even savvy professionals to make money from. With so much online tutoring jobs to choose from, the expected pay rates differ based on the industry, teaching experience, and educational qualification you may possess. Questions like how much can you earn working with an online tutorial gig, which online tutoring jobs pay the most, and what things you need to get started, have all been discussed in this article. 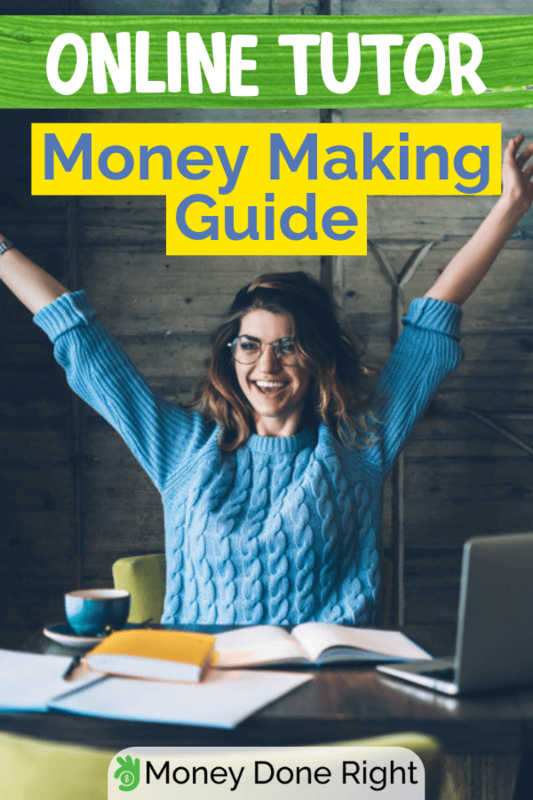 Without further delay, here’s the ultimate guide to becoming financially independent by tutoring online for money. Are you an English language pro? Click here and start making money by becoming an English tutor! Make Money Online Tutoring: Is It Worth It? Tutoring positions for K-12 classes (students starting from Kindergarten to 12th grade) have stringent requirements because your students are still in their formative years. To be considered for this post, ensure you have a college degree from an accredited institution. Also, having a state teaching certification and previous teaching experience could be an added advantage. The number of people who speak English as their second language varies between 470 million to over 1 billion. Apart from English being the third-most common primary language in the world, after Mandarin Chinese and Spanish, it is also a useful language to know when working internationally. Hence the demand for skilled English tutors remains at an all-time high. The standard requirements for English tutors are that firstly, you have to be a native English speaker. Secondly, you should either be currently enrolled as a college student or already have graduated with a degree. Some companies prefer if tutors have teaching experience and a language certification like TEFL or TESOL. Click here to dive right in! Earn extra money by teaching English. The primary requirement before you can be accepted as a tutor for test prep is to pass a specific score on the standardized test you plan to help your students take. Most times, you’ll also be expected to have a college degree as well as some teaching experience, and even a teaching certification. There are also tutoring opportunities beyond grade school or ESL. You can make money by teaching college students who need continuous academic support or professionals of all calibers looking to pick up extra skills for self-development. To get these jobs, you must be in college or have a college degree. In some cases, you may need to have post-graduate qualifications before you can be considered. Not quite right for you? Here is another way you can make money online: taking surveys with SurveyJunkie! Elevate K12 is an online tutoring platform that allows teachers to provide one-on-one live instructions to students starting from Kindergarten to 12th grade. With Elevate K12, you will be required to teach your students while they are in school, instead of after-school lessons. You won’t be expected to create lessons – you will be provided with a curriculum. Hence there is a strict work schedule each week. However, the work time you’ll put in depends on how many hours you can commit. You should be available to teach on weekdays between 8 AM and 5 PM EST. You can make money online tutoring subjects like Math, ELA, Reading, Science, Social Studies, Foreign Language, and Robotics. Before you can be accepted to work as a tutor, you should have a bachelor’s degree or be working towards having one. Relevant teaching experience is also a prerequisite for acceptance. Elevate K12 pays every month and tutors are paid $15 per hour. But if you do not have a teaching degree, pay rates are reported to be around $12 per hour. You can save up your earnings to a substantial sum with Long Game – a fun way to save money! MathElf offers online math tutoring services to K-12 students as well as college students. The platform has worked with more than 46,000 students since its inception in 2014. As a MathElf tutor, you can decide which math-related subjected you want to major in. The gig is a part-time one, and the schedule is extremely flexible. MathElf requires that prospective tutors must have a bachelor’s degree and at least one year of math teaching or math tutoring experience. Also, you should be able to speak and write English fluently. MathElf pays tutors $20 every hour. According to the company, as a math tutor, you can earn an average of $270 monthly. Payments are made every week via PayPal. Looking for another great way to make extra money while also getting fit and healthy? Try HealthyWage! TutorVista is a popular online tutorial platform that caters for the tutorial needs of students all over the world. The company boasts of serving over 11,124,000 live tutoring sessions, with more than 2,000 qualified teachers from different nations. With TutorVista, you can earn money tutoring online subjects like English, Math, Statistics, Physics, Biology, Chemistry, and Grammar. The work schedule for TutorVista is flexible, and you can apply as either a part-time or full-time tutor. However, you should be available to tutor for a minimum of 4 hours a day. To qualify as a tutor, you should have a Master’s degree in your subject as well as some teaching experience. You can earn between $10 to $40 per hour depending on different factors such as experience and the type of subject tutored. If you’d like to check out other opportunities to earn money asides online tutoring, click here! Tutor.com is one of the best online tutorial websites that links qualified tutors with students. According to Tutor.com, its pool of teachers includes professors, adjuncts, Ph.D. students, industry professionals, and other experienced individuals who are experts in their chosen fields. Hence, Tutor.com has one of the strictest requirements for choosing their tutors, and they recruit only the very best. It requires prospective applicants to have at least a college sophomore or higher – or possibly have a degree from an accredited college/university (or be making plans to obtaining such degree). But if you feel you have what it takes to teach subjects like Statistics, Calculus, English, Physics, accounting, computer science, and economics, then this platform might just be right for you. Tutor.com pays hourly, and the pay rate for tutorials depends on the subject you teach, and you can earn incentives based on the quality of your work. Tutors are expected to put in at least 5 hours weekly. However, according to Glassdoor, the average rate is between $9 to $13 per hour which seems a little low considering how strict the requirements and application process is. If you pass the exam set by Tutor.com in the area you wish to tutor in, you will still have to go through a mock tutoring session, and also pass a background check. If, however, you do not get accepted, you can check out other cool ways to make money here. Chegg connects people who need tutoring ranging from middle and high school students, college students to professionals with capable tutors. The application process is relatively straightforward – you’ll need to provide necessary identity-related information and a photograph. You will also need a Facebook account. To qualify as a Chegg tutor, you will need to show proof that you’re currently a university student or you already have a degree. Afterward, you might be required to complete a subject test before you can tutor in certain subjects. Chegg caters for subjects like Mathematics, Biology, English/the humanities, Engineering, and even Astrophysics. Once your application has been approved, you will be matched with students seeking tutoring in your chosen subject. Chegg requires tutors to have access to a computer with a webcam/microphone, but lessons can also be conducted via text. The starting pay rate on Chegg is around $20 per hour. If your work rate is high, it’s not impossible to earn as much as $1,000 every month from online tutoring with Chegg. Skooli is another website that can help you make money online tutoring. It provides instruction for K-12 classes including college-level subjects. Skooli only employs the best qualified teachers available. Before you can be considered, you must have at least a Bachelor’s degree and certified teacher qualification education, a Master’s degree (or Ph.D.), a state teaching license, or ESL certification (or another appropriate language certification). To apply for Skooli, you will be required to provide proof of your educational qualifications as well as some identifying documents before you can be approved. Upon approval to become a Skooli tutor, you can be earning $25 per hour. You will start getting paid via PayPal once you reach a threshold of $100. Schedule with Skooli is flexible, and you’re allowed to choose your working times. Here are more options you should consider for making extra money online. If you want to make money online tutoring, Studypool is one of the more exciting and innovative alternatives to achieve this goal. How does Studypool work? Students post questions on any subject or topic on tutors enter an auction and compete for the chance to answer those questions to earn money. If a student likes your qualifications and price quote, they can pay you to help them with their work. However, there is a timeframe you’re expected to work with when providing answers to these questions. To work with Studypool, you need to provide necessary identity-related information, and also confirm your educational qualifications and experience. Having a degree is an added advantage if you want to create a more professional profile. According to Studypool, tutors can earn as much as $5,000 every month based on their reduced commission rates system. Compared to other online platforms, Studypool charges between 15% to 30% commission on what you earn. Studypool has standard rates for answering questions in a Q/A format or by writing paragraphs/papers for students. You can earn as much as $30 for every page you write if you’re answering questions posed by a Masters/Ph.D. student. Or you can choose relatively easier pickings from your area of expertise from questions posed on the Studypool feed. After completing an online tutorial gig, you’ll get paid via PayPal a couple of days later. Brainfuse is a website that offers 24/7 online tutoring services in a broad range of subjects, from elementary to college level. Because Brainfuse provides live tutoring using a virtual whiteboard, you don’t need to own a microphone or a webcam before you can teach. You can apply as a tutor and earn money tutoring online. If you want to become a Brainfuse tutor, having a bachelor’s degree in the subject you’ll be tutoring is essential. Also having previous teaching or tutoring experience can also be an added advantage to get chosen. Upon acceptance, a registration code will be sent to your mail to enable you to complete your registration. Brainfuse is relatively flexible, and it allows you to work at your schedule, only paying after you finish delivering your lecture. The pay rate depends primarily on the subject you’re teaching. However, average hourly rates are between $10 to $15, according to Glassdoor. Here are more ways to earn money from the comfort of your home. TutorMe is another online platform that offers tutoring services for over 300 subjects, including ACT and GRE tutoring. They not only cater to the grade school subjects, but TutorMe also offers standardized test prep, and also provides help to those seeking to learn skills such as programming. Before you can be considered for a tutoring position with TutorMe, you must be currently enrolled or must have graduated from an accredited college/university. The educational qualification apart, you must also have previous teaching or tutoring experience as well as mastery of the subject(s) you plan to teach. It is important to note that the acceptance rate for online tutors with TutorMe is just 4%. Ensure that you’re sufficiently qualified before sending in your application. The hourly pay rate for active lesson time, which includes time spent on written lesson explanations is $18. They pay every week via PakyPal. The quality of your lessons affects your ratings which in turn affect how much you’ll earn. Yup is an online tutoring platform explicitly aimed at those without educational qualification, or teaching experience to provide them with a way to earn money tutoring online. This platform offers the perfect online tutoring jobs for college students and other people who need them. Yup tutors are usually quite proficient in math or science because the students they cater for are those who need assistance in learning concepts behind mathematics, algebra, geometry, trigonometry, probability, and calculus. After you register on the site, you’ll be required to take a teaching exam followed by a subject exam for each subject you want to tutor in which you must pass before Yup can consider you. A few factors such as teaching experience, educational qualifications, and performance determine your pay rate. According to Glassdoor, Yup tutors make between $10 to $13 per hour, and they are paid every month via PayPal or direct bank deposit. If you’re not proficient in Math or Science, you could always opt to teach English here! Student Tutor is a private online learning platform where you can provide live tutoring to students of varying age groups and academic needs. One of the main features of Student Tutor is that you don’t need a degree or teaching experience before you can tutor students. The primary requirement is your expertise in your chosen field of study. Student Tutor is an excellent example of online tutoring jobs for college students. You should be available to teach for at least two days a week, and for three consecutive hours for every day you teach. In essence, tutors are required to put in 6 hours of work every week. You’ll have a higher chance of getting accepted to be a tutor for this company if you can work with them for at least one calendar year. The pay rate for Student Tutor is determined by the academic needs you cater for. For teaching any academic subject, you’ll be paid $16 per hour. If you teach SAT/ACT candidates, you’ll earn $23 per hour. Revolution Prep is a platform that offers private and semi-private online tutoring, plus homework assistance, for students in grade levels 6 through 12. Before you can be considered for a tutoring job with Revolution Prep, you must have at least a bachelor’s degree and relevant teaching experience. This company is a good choice if you’re looking for a full-time online tutoring gig. Working with Revolution Prep means you are ready to put in at least 30 hours every week, and there would be instances where you have to work during weekends or evening hours. They call these hours “prime tutoring hours,” from 12 PM to 9 PM PST on weekdays, and 7 AM to 8 PM PST on weekends. You can earn quite a lot from working with Revolution Prep. The pay rate is between $25 to $30 per hour, excluding added incentives like health insurance, a 401(k) and paid time off. Doesn’t sound like your thing? Not to worry, here are other ways to can earn money online! Finding a side job that can earn you good money can be quite challenging. You can earn money tutoring online and build a profitable source of income whether you want to go into tutoring full-time or part-time. Some of these online tutoring platforms we’ve detailed have specific requirements. As long as you’re very conversant with the subject you wish to teach, or you have the educational background and teaching experience required, you can get pretty good earnings tutoring online and begin your productive journey into the world of freelancing. Put your English language skills to use. Sign here to get started as an online English tutor! Which online tutoring service would you go for and why? We’d love to hear from you in the comments.